Bunnies and Ducklings are learning new things everyday! During the last days, the Bunnies and the Ducklings learnt a lot of new things while playing. 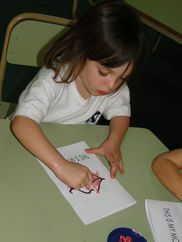 We also started to talk about who is a boy and who is a girl. Two friends of the class (a girl and a boy) lay down on a big sheet of paper and we drew the outline of their bodies, looking at the differences and similarities between girls and boys. We discovered that we all have two eyes, one nose, one mouth, two legs, two arms, one head and hair! We had lots of fun! Finally, we learnt a new colour. We already knew the colours yellow and red, but we now know the colour blue! We painted with blue paint and fingerpaint as well. We really enjoy playing and learning altogether!